The cardiovascular system, also referred to as the circulatory system, is comprised of the heart which pumps blood to the rest of the body via blood vessels, specifically the arteries. It is our blood that transports oxygen and the essential nutrients around the body to fuel our cells. Blood also removes carbon dioxide and waste made by the cells and returns to the heart via our veins. The heart itself is separated by a muscular wall into two sides, the left side of the heart pumping oxygen rich blood around the rest of the body and the right side receiving carbon dioxide rich blood which is pumped back to the lungs to receive more oxygen. The pumping of the heart is controlled by nerves which conduct electrical signals to the different chambers of the heart. It is the coronary arteries that provide the heart muscle itself with a blood supply. 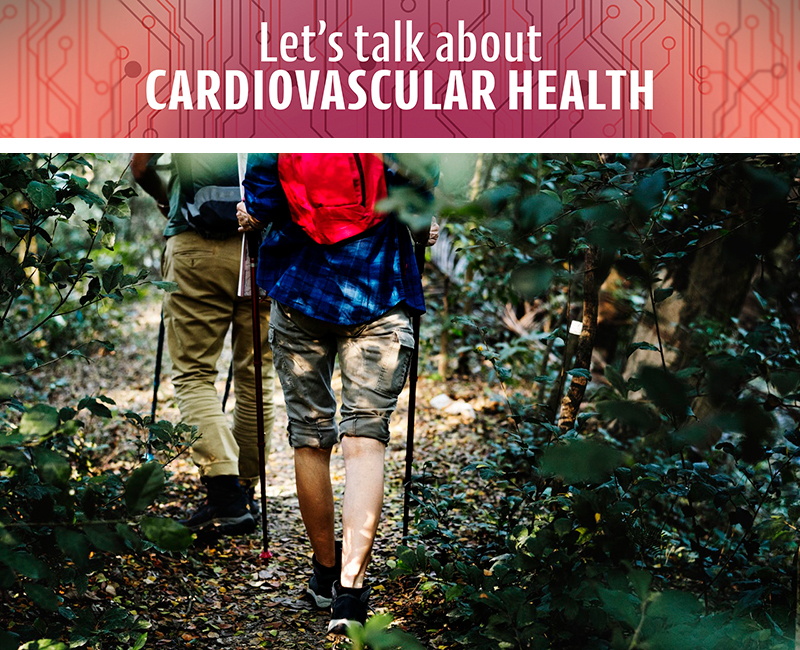 Cardiovascular issues can arise when lifestyle choices including smoking, poor diet, inactivity, and being overweight cause the system to work inefficiently. These modifiable lifestyle choices can lead to risk factors such as hypertension (high blood pressure), high blood sugar levels and endothelial dysfunction which increases the risk of atherosclerosis. Atherosclerosis is the build-up of plaque in the arteries from naturally occurring substances in the body such as cholesterol. This causes the arteries to narrow and become less flexible. This is a serious condition as over time the plaques can restrict the blood flow and oxygen supply to vital organs. It may also increase the risk of blood clots which increase the risk of heart attacks and strokes. Eat well: A healthy diet can help lower your risk of developing coronary heart disease and prevent weight gain, reduce your risk of diabetes and hypertension. Aim to eat plenty of fruit and vegetables to ensure a high fibre intake which has inversely been associated with heart disease[i]. Limit processed foods as well as those rich in sodium and sugar.